They say a change is as good as a holiday so over the next six Fridays I will take you on a delicious tour of the world through six countries unique take on eating the humble french fry. This week we kick off the tour with the most gluttonous of all stops, the USA and their Animal Style fries made famous by the good folk at In-and-Out Burgers. This artery clogging dish is packed with french fries, caramelised onion, melted cheese and a surprising delicious sauce of tomato sauce, whole egg mayonnaise, vinegar and dill pickles. Cook McCain Superfries Shoestring as per packet instructions. Meanwhile, combine tomato sauce, whole egg mayonnaise, dill pickles, caster sugar, vinegar, salt and pepper in a small bowl and whisk well to combine. Place oil and butter in a large fry pan and heat over a medium heat. Add the onions and a good pinch of salt, turn heat to low and cook very slowly for 15-20 minutes, stirring occasionally to prevent them from catching. Don’t be tempted to turn the heat up, as you don’t want the onions to burn. Remove McCain Superfries Shoestring from the oven and pile on an oven proof serving dish. Top with shredded cheddar cheese and caramelised onion, and place into a warm oven (180C fan-forced) until the cheese just melts. 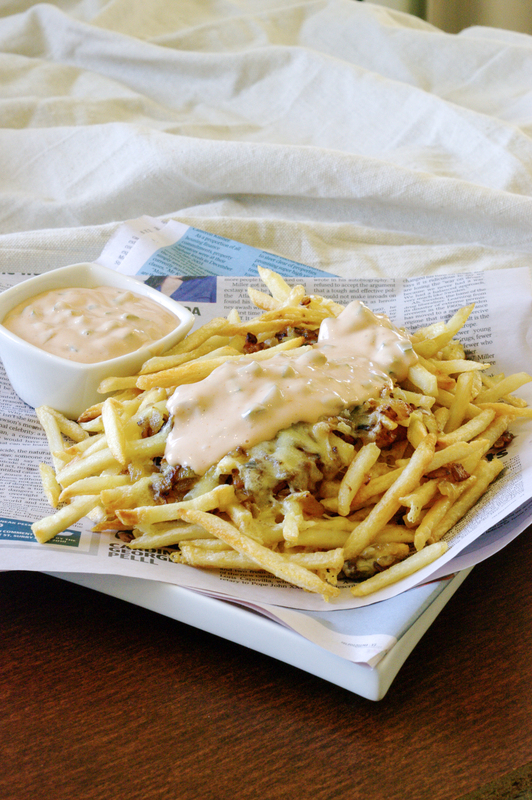 Top the fries with a generous amount of the Animal Style Sauce and serve.